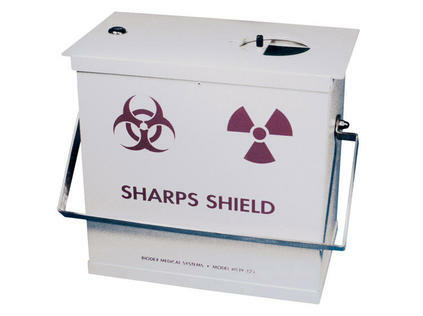 This Sharps Container Shield is a simple way to dispose of used syringes that may be contaminated with low-energy gamma and beta radiation residue. The shield is constructed of steel, lined with .125" lead and .0625" aluminum. The shielding combination attenuates gamma radiation, beta radiation and errant bremsstrahlung. The shield features a top with sliding port and a swing hand for easy transport. It is designed to accommodate small and medium Monoject Sharps containers.